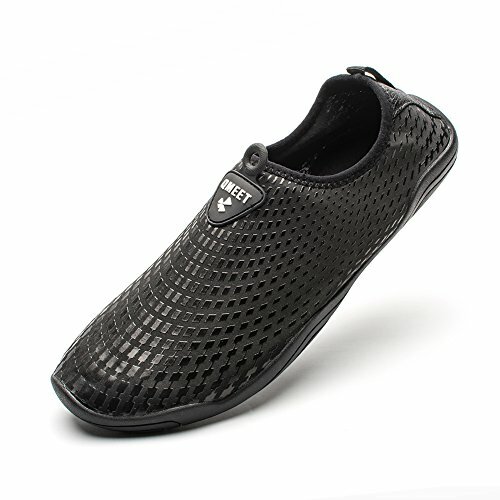 Our quick dry water shoes are made of high quality rubber with thick foam arch-support inside them. Ergonomic design and stretchy material give you breathable and skin-touch feeling ,making it easily to put on and take off. They are lightweight and compressible for easy packing, convenience for leisure and ideal for any activity ,beach, sailing, boating, cycling, walking , fishing and yoga. Our shoes are designed with exquisite material and workmanship to meet your satisfaction. You can reach out to us any time if you have any dissatisfaction with your purchase. Ideal for beach, swimming, pool, sailing, boating, cycling, jogging, walking, fishing, beach volleyball, gardening, lawn, surf, beach walking, yoga, weatherboarding, shower, bathroom and etc. Quick Dry:Drainage system on the bottoms make water easily drain out. Flexible and Comfortable,breathable and smooth fabrics with fine stretch on uppers,perfect for water sports. Foot Safety:Anti-slip and flexible rubber sole is thick enough to protect mens womens feet from scratching and stabbing injury when stepping on rock and stone. Ensures a safety and comfortable wearing experience. Light and Comfortable:You don't even feel anything but only freedom and comforts, a barefoot walking feeling results from the skin-friendly, ultralight, breathable and cooler aqua shoes, which effectively helps exercise foot muscle. Easy to Carry:You can take it everywhere conveniently,flexible shoe structure occupy little space,the weight is light,the carrying is very convenient. Perfect for Any Activity: Not only suitable for water sports such as beach, swimming pool, swimming, sailing, surfing, diving, snorkeling, boating and yoga. However, it can also be used as a substitute for indoor slippers, walking shoes or treadmill trainers, and used during light activities or breaks. If you have any questions about this product by QMEET, contact us by completing and submitting the form below. If you are looking for a specif part number, please include it with your message.